Everyone has some dreams to accomplish in life, but only a few have the guts to consistently work for them and hence awarded by the destiny. 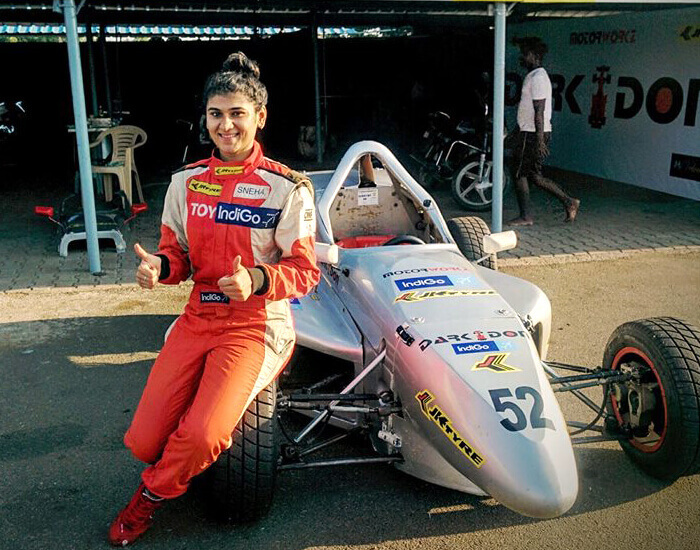 We all are familiar with India’s fastest F-1 racer Narain Karthikeyan but what we hardly know is India also has a female racer entitled as India’s Fastest Lady - Sneha Sharma. The girl has chased her dream to lead the race track, scripting her name in the history of Indian sports and putting an example in front that there is nothing girls can’t do. 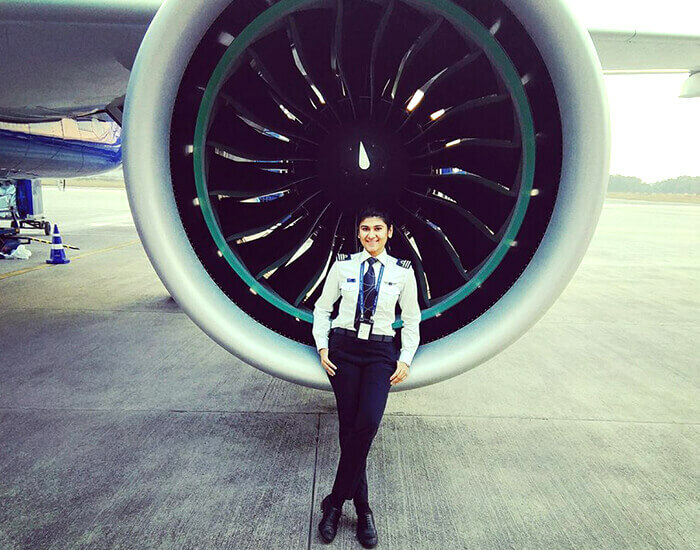 In a very short span, Sneha has proved to the world that only sky is the limit. 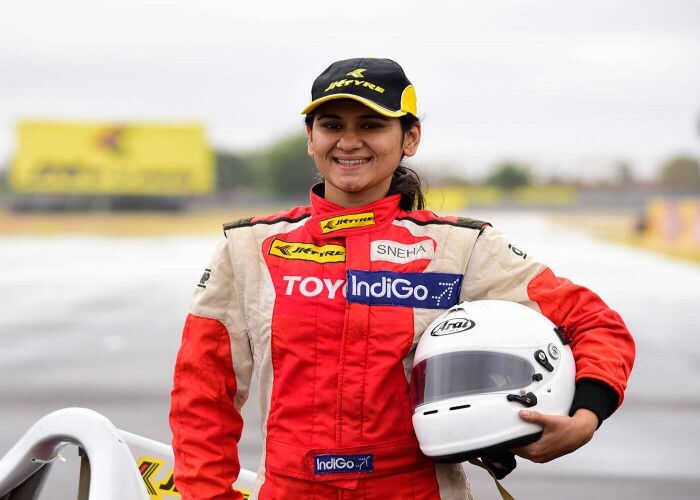 She is India’s fastest woman racer, an accomplished pilot of Indigo Airlines and a motivational speaker having spoken on platforms such as Ted. Here are some pieces of the conversation that Sportsmatik.com had with her and found really inspiring. My passion for what I love staged when I was very young. I used to cycle very fast with my sports cycle. Often I used to ride on the streets, and there would be bike racers racing with me in which I would usually win and had comments from them like “Wow! nice riding!”. I knew there is something inside me and I need a platform to express it. That’s when I heard about Go-Karting in my town. So I went there and tried my hand on it. And the moment when I sat in it, the adrenaline rush was like never before, and I decided that this is how I want to feel for the rest of my life. Then I put all my time and pocket money into it. I was 14 then. I started practising and did laps and laps, ending up with the fastest lap time of the day on the first day itself. So I knew it was my calling. After my 10th, I decided to get training. One day, I saw two high-speed drivers, driving on the race track in sync and they looked so professional. So I asked the mechanics about those racers and found that they were in the national championships. Since I had no access to professional training, I asked those mechanics to train me with whatever they know because those guys at the end of the day used to drive the karts and race with each other. I later moved on to race saloon cars and formula cars. I currently drive the formula 4 LGB in the National Championship. 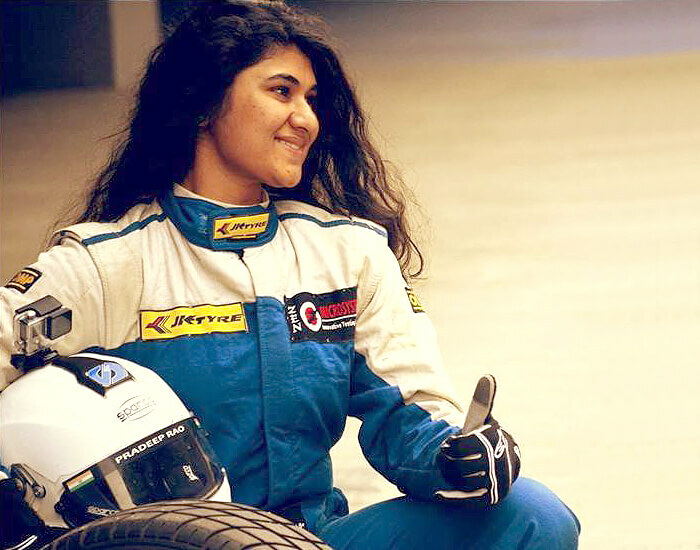 A car racer, a full-time pilot, a motivational speaker. How did you manage all your roles? Yeah, it is difficult to manage my time. My Airline definitely supports me following my passion and having said that I fly as much as other pilots do. I think it’s your passion that really keeps you going and there is a lot to do in life. I always believe in focusing on the next step. I think time management plays a huge role for doing my various jobs. After the high pace of life, I like to spend time with nature. To get relaxed, I talk to myself, switching my phone off and spend a few days alone and then come back to my form. What was the role of your parents in your sports career? My parents are not much into sports but education. So they were like how has she started having a craze for such a dangerous sport and that too being a girl. Initially, I used to practice once or twice a week then every second day. When I realised that my parents were stopping me, I started hiding my helmet outside the house, jumped the wall and go because I didn’t want them to know about it. I always feel if I am fulfilling my duties then I also have the right to follow my passion and I was fulfilling my duties. I used to carry my books on the race track and study between the race sessions. 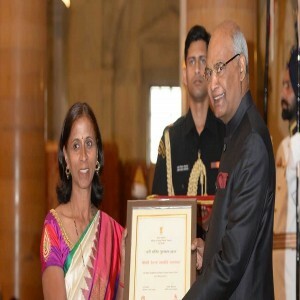 I also carried my books in trains or buses whenever I had to travel for nationals because when I was 16, in class 11th, I started preparing for my flying training which I did from the USA. I started my ground classes in Mumbai. But being a science student, it was very difficult, but I had to take that dive in the plunge as my heart called for it. I always wanted my parents to participate in my events, but they didn’t understand initially. But when I won one or two national races, they realised that they can take the girl out of racing but can’t take racing out of the girl. So that’s when they agreed and supported my racing which is really good support. I never had friends or family who understood or supported me. So I always devoted myself to the famous legendary people and the quotes, videos of Nelson Mandela, Albert Einstein and Oprah Winfrey. I always seek motivation from these people. Even I read Mark Twain's writings. Ayrton Senna is my racing idol because he was crazy about his sport and loved and lived racing. Describe your philosophy on discipline? Yeah definitely, discipline is the key. Self-discipline is necessary to achieve anything in life. Because I always believe that you have to be your worst critic. If you are your worst critic, nobody else can criticise and put you down. By this, you can make yourself nearly perfect, and nobody can have the opportunity to say anything to you or beat you. Another thing is that discipline is essential because people try to excel in their job and career. But I always believe that before you try to push a machine or device to its limit, you have to push your mind and body to its limit. Because your body is the first thing, you operate before any machinery. I think mental and physical fitness is the big part of doing anything in life because when you cannot breathe and still push yourself, your mind breaks all limits and you then, achieve excellence. Because I have had many injuries, broken bones and petrol burns in racing, but my passion for the sport and discipline kept me going. You require discipline to wake up every day and keep following your dreams, even when you don’t see immediate results. That is what makes a champion. How F4 racing is different from your pilot job and what are the similarities? Yeah, they are very similar and very different at the same time. They are both high-speed machines with high technologies that come with a lot of responsibilities because you have not only your life in your hand but also other's life as well. When I am racing, my fellow competitors are my responsibility too. If I’m going off track due to some technical difficulties, I have to make sure that I go off track in a place where it's safe and doesn’t hinder anybody. Both are high disciplined professions. I feel the similarity is “quick decision making”. In both, we have different speeds. In aircraft, we have 850 km/h, but the ground speed goes up to 1000 km/h which is with the wind variation. So this helps in syncing reflexes which is very similar in both. When I started racing; mechanics were my first coaches because I didn’t have the background. Later on, I raced in major championships that had coaches from Germany teaching us about the techniques. Post that, I went for Volkswagen and next for Toyota where I had Japanese trainers. Most often I trained myself with Go-Pro videos and analysed where I am making mistakes and where are other drivers making mistakes to mark where I could get that extra position and point. People are not aware that racing is a very physically demanding sport also. At the age of 16, I touched 90 kgs. So I lost 30 kgs of weight to be able to be fit for myself and my racing. That was a very big journey which made me very strong and taught me to be disciplined. I always believe that a workout should be fun. It might be challenging, but it definitely should not be boring. So I swim, do push-ups and power yoga. I am also going to be associated with the Mumbai Yoga Institute. 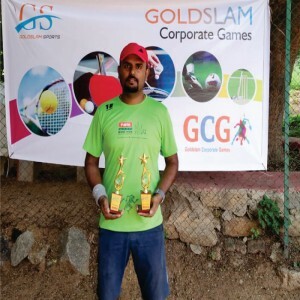 Besides that, I have played competitive badminton with my airline where I won the tournament for Indigo in doubles and for my Bangalore base; I have won for the south zone and against other companies as well. It’s not all about physical but mental as well as emotional fitness too. 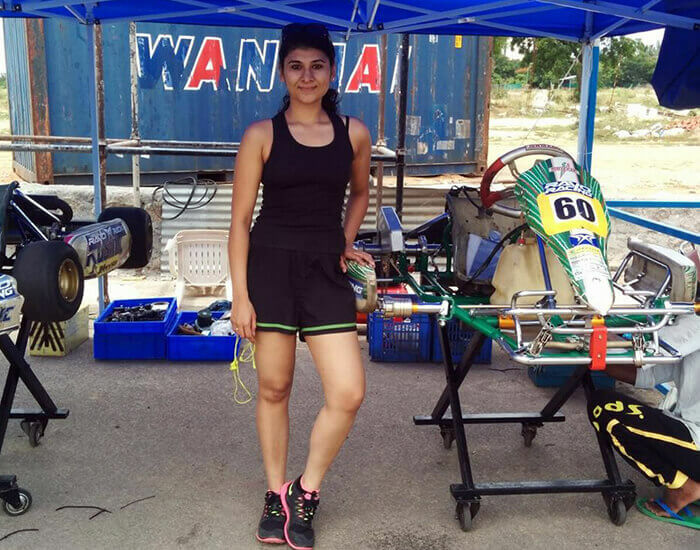 You were the only girl to qualify for the final round of the KCT of the MAI National Karting Championship. How tough was the competition? Yes! 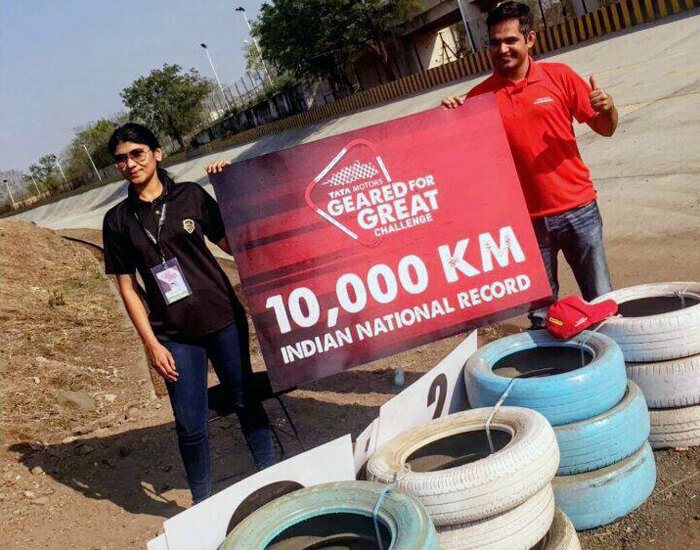 It was tough because there were only 10 drivers selected across the country and there were thousands of people who participated. I am the only girl who has qualified for the KCT category to date. Quite often I would qualify for the open (men’s) as well as the women’s only category. But competitors would protest against me participating in both categories because they feared I would win easily in both, so I always picked the harder category and drove myself to international standards as compared to obtaining an easier win. 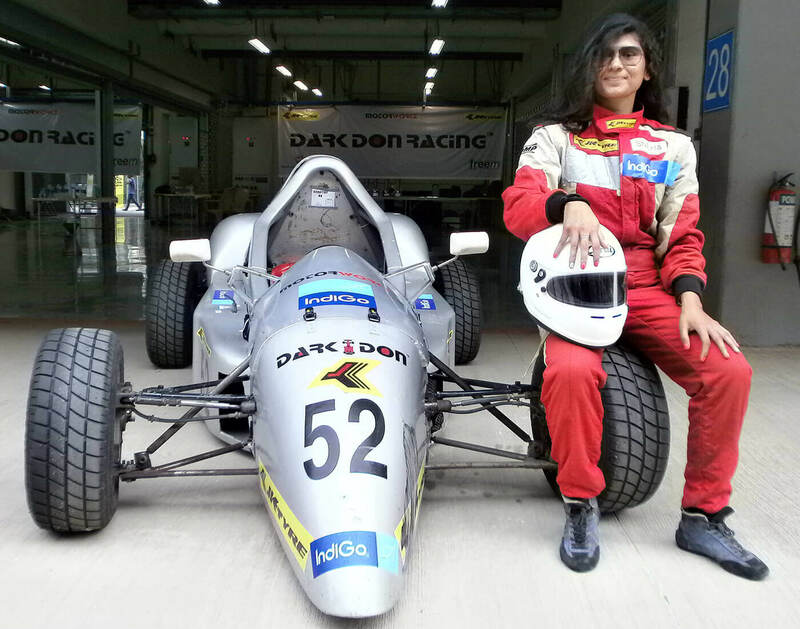 There was also a Mercedes Young Star Driver Programme which was the fastest competitive event in India where I opted the speed of 270 in the Buddha international formula-1 Circuit of Greater Noida. I was in the top 20, then 15, then top 6 and eventually in the top 5 in the nationals, being the only girl there, after which I was awarded a Michael Schumacher autographed model car. It was a great feeling as we stood on top of the podium and the national anthem was played; that was really a proud moment for me. I always chose to participate in the upper one, and that’s how I became an international standard driver. I have been the only girl to qualify for that event. It was difficult as people used to push me off the track used to comment and say that women don't know how to drive, etc. What are the thoughts you have before starting any race? There is always a strategy to win in my mind. First, for making sure that my car is good and the suspension setting is correct with the right temperature. Then I have to make sure at which corner I should overtake. For some seconds, I close my eyes and imagine my whole race, driving the track. You need to warm up your body because if you’re in the full cold state, you can’t make those quick decisions. So I listen to music, don’t talk to anyone and don’t give interviews before the race. I stay dedicated and focused. What does your sport has taught you as a real-life lesson? The most important thing which my sport has taught me is the value of time because, in racing, time is measured in 1/1000th of a second where even a .1 second can make a huge difference. So a racing driver must value time. Because I believe, the currency of life is time and not the money. So I do things fast to do more things. You need to build up your skills and then start. What were the hitches faced by you during your sports career? How did you deal with negative situations? When you are racing; it’s very high pressure, having 20 cars behind you trying to overtake you. You need to train your mind to work under pressure. Even when I am not racing, I constantly put my mind under pressure to learn how to make decisions and function optimally under pressure. See, there are lots of people who used to tell me that you are a woman and can’t drive. But, what I keep in mind is that once the helmet is on, I am not a man or a woman, I am only a racing driver. This is the attitude I carry in my life. I don’t mix things. When I am a pilot, I am a pilot, and when I am a racer, I am only a racer. I had to train my mind to think like a professional and not like a man or a woman to be able to switch on and switch off my mind when required. Why did you choose a career as a pilot in spite of having a successful racing career? It was completely my decision. I was a very odd child and have been very sure of what I wanted to do. I was born in Calcutta, but as my Dad is in Merchant Navy, I was brought up in Mumbai and travelled to many countries. We used to travel for 2-3 months on ships. Once, I looked at the clear sky with shining stars and one star was moving, and that was an aeroplane. That’s when I wanted to fly an aeroplane to do something related to speed and technology. And more than that, even though racing was my first love, I knew I am from a background where I need to support myself and my family as well. I needed a salary-paying job also. Although I do believe that one should make one's passion one's pay-check yet I started flying, constantly working on my passion and reached height. How did you manage to cover your training expenses? I have worked as a trainer/manager and mechanic on the race track at one point so that I could subsidise my driving cost. I have also worked as a Senior Accountant so I could get a discount for my racings. I invested all my energy, time and money in my passion; until I got sponsors. Indigo and JK Tyres are my prime sponsors. I have also been sponsored by lots of people like Toyota and Mercedes. I have set a national record for TATA and have done shoots for Renault and all these automotive companies. I am also working on a web series and am a Road Safety Ambassador for Maharashtra Government. Where do you look yourself in the next five years? I see myself racing and representing India on the international grid. I have offers from Germany and Malaysia which I am waiting to take. I am also doing command training and have almost completed it to get upgraded to Captain on the Airbus A320. I am also doing a web series which is coming in this year-end or next year beginning. I also got a call from TV show Big Boss which I currently refused. I am doing some television-related things as well. Apart from this, youth development is the very major thing in which I am going to indulge in because I have struggled a lot to make my dreams come true. I want to mentor them to achieve their dreams. 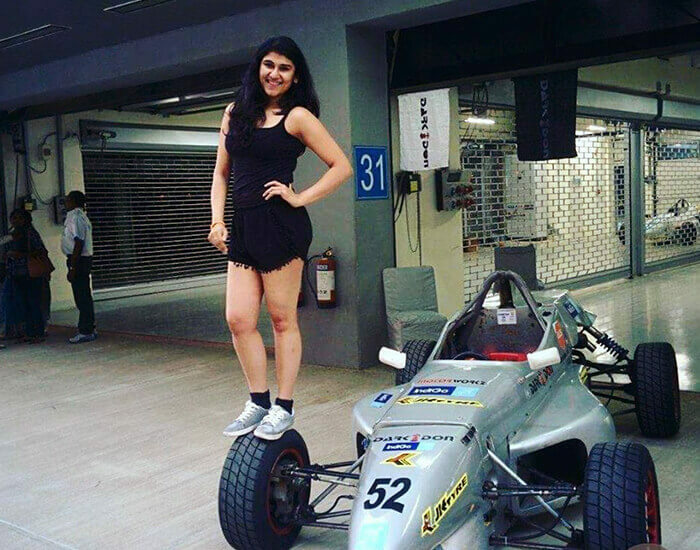 What is the future of car racing in India, according to you? In 2019, the racing league is going to start. 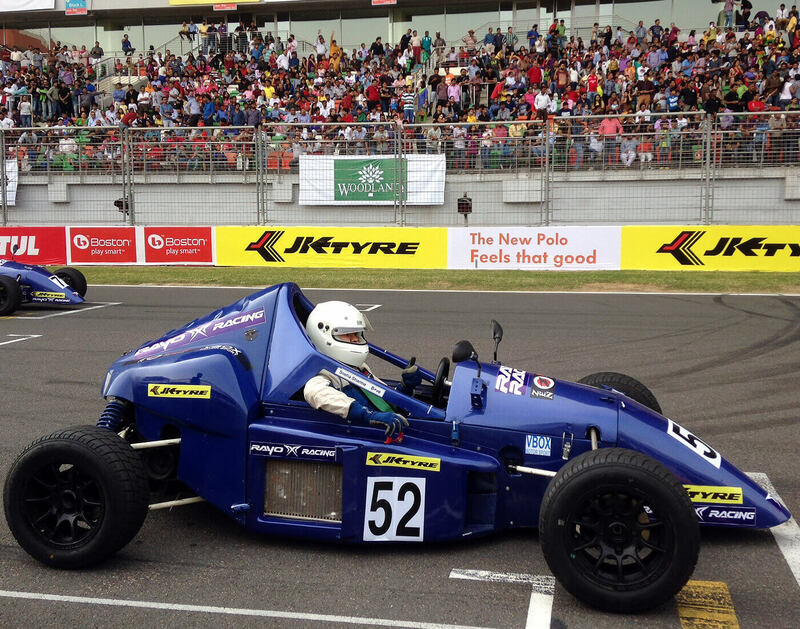 We have three major facilities of formula racing tracks in India. The youth is really getting interested in this sport, and I can say that because that’s a kind of response I have on my fan pages. I myself have tried to play a huge role in creating awareness as I have been racing for past 12 years and I think it has a great future. Our international drivers are creating great names for India in abroad in spite of not having a strong infrastructure as other countries have. So I think it’s bright. What are your views on the initiative taken by Sportsmatik.com? I think it’s great especially in a country like India where sports have picked up a couple of years back. 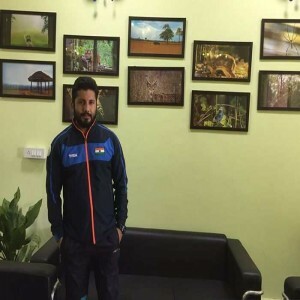 People are still like padhai karo, sports mat karo, career banao, and I think Sportsmatik.com is giving people a great platform to showcase themselves and promoting the youth and sports because sports build the morale of a country. It’s not just about a person when you play a national sport; the body does not belong to you anymore but to the country. 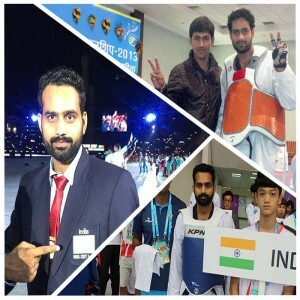 I think more people in India should indulge in sports and Sportsmatik.com is helping them do it. Best wishes to you!